Total number of chromosomes is 47. Symptoms: Small jaws, deformed ears, small mouth, nose and fingers, small sternum and pelvis. The common anomalies of D-trisomy include hare-lip, cleft-palate, sloping forehead with relatively small head and brain and defective eye development. First autosomal aneuploidy, described by John Longdon Down (1866) under the name of mongoloid idiocy or mongolism. 47 chromosomes instead of 46 with three copies of chromosome 21 instead of of usual two. The frequency of non-disjunction of chromosome pair 21 increases with mother age. The frequency of abnormality is 1in 600 live births. Clinical symptoms : Male with slowly degenerating testes, enlarged breasts. Symptoms: Person has a small head widely spaced eyes, moon like face , cry like kitten, and congenital heart disease. Caused by the complete loss of one chromosome of the 21st chromosome pair. Symptoms: Nose is prominent and distance between the eyes is less than normal, ears are large and muscles are contracted. It brings about change in the conformation of C-Abl protein and activates a latent oncogenic potential causing production of excess of granular leuckocytes and hence called chronic granulytic leukemia . This 22 nd chromosome whose a little segment from long arm is deleted , is called Philadelphia chromosome, as it was first reported in the city of Philadelphia in 1959. Neuro-degenerative disease of brain is caused by the accumulation of Amyloid protein plaques in the brain resulting in the degeneration of neurons. The protein involved, Amyloid β peptide is produced and processed in a number of ways in the brain. 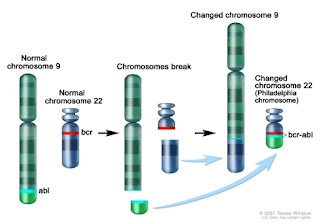 This disease is due to ageing and involvement of two defective alleles, one on the chromosome -21 and other on chromosome 19.